In September 2017, a yellow spot leaf disease was noted on the leaves of Prunus davidiana (Carr.) Franch. plants in Liaoning, China, and spherical virions (approx. 30 nm in diameter) were later observed in preparations of symptomatic leaves. Subsequent deep sequencing of small RNA revealed the presence of a virus in these symptomatic leaves The complete genome of this viral isolate consists of 6,072 nucleotides, excluding the poly(A) tail. 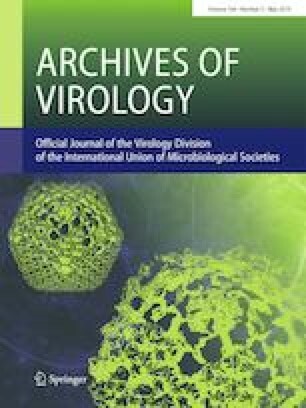 The virus showed the closest genetic relationship to grapevine-associated tymo-like virus, reported in Colmar, France (GaTLV, MH383239), which is the sole member of the newly proposed genus “Gratylivirus” within the order Tymovirales, which is currently unassigned to a particular family. The virus clustered closely with GaTLV in a phylogenetic tree constructed based on complete genomic sequences. On the basis of the nucleotide and amino acid sequences of the replicase and coat protein genes, this virus shares the highest (although still relatively low) sequence similarity with those of GaTLV (41.6%–60.8% identity), indicating that the virus is a distinct member of the order Tymovirales, for which the name “prunus yellow spot-associated virus” (PYSaV) is proposed. To our knowledge, this is the first report of a virus naturally infecting P. davidiana. Handling Editor: F. Murilo Zerbini. The online version of this article ( https://doi.org/10.1007/s00705-019-04220-1) contains supplementary material, which is available to authorized users. This work was supported by funds from the Natural Science Foundation of Liaoning Province (20180550863, 2015020806) and the Fundamental Research Funds for the Central Universities (XDJK2018AA002). We thank Zhenguo Du and Fangluan Gao of Fujian Agriculture and Forestry University for useful discussions and help in constructing the phylogenetic trees, respectively. This article does not contain any experiments involving humans or animals that have been performed by any of the authors.